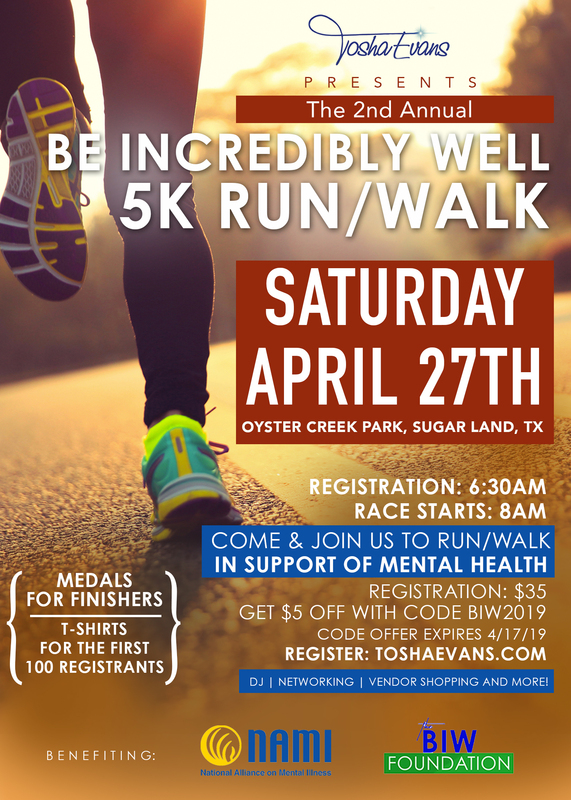 We are absolutely thrilled about our 2nd Annual Be Incredibly Well 5k Run/Walk for Mental Health awareness! Mental Health is silent, subtle and rears its head in many forms like: depression, suicide, anxiety, mental/emotional abuse, low self esteem, post traumatic stress disorders and more. We are committed to helping individuals lead healthy whole lives and this run/walk supports our efforts tremendously. Also, check out our 2018 5k in the video below. Update: we have a 3 more open slots for Vendor Booths! Whether its you or someone that you know - that's looking to boost your business visiablity contact us today. 713-487-9034. Rain or Shine we Run!!! Questions: tosha@toshaevans.com or phone us 713-487-9034! See you at the starting line!